This post has been long overdue as the best thing I have created so far turned a magical 4 this year on the 10th of March. It’s been 2 academic years since he started school, playschool to be precise at 2 1/2 years old and I’m still getting used to the silence at home when he is in school for a few hours. And my heart still skips a beat and leaps with joy when I hear those magical words “amma (mother)” from my precious little one after a short absence of a few hours. My day begins with showering him with kisses, waking him up and getting him ready to school and usually ends with showering him kisses, getting him dressed for the night and putting him to bed. Seemingly mundane tasks, day after day, but ones that give me contentment that none other engagement could give. What has changed in these four years is the level of reciprocity in our relationship. Life gets more exciting as he discovers and learns new things, makes new friends and the way he communicates with me! The poems he sings for me (am not kidding!!! ), the cards he makes, the words he utters are all safely locked up and stored for posterity in my heart knowing well that when life gets drab or monotonous or sad, these are the things that would brighten and colour my life again. Not being a night person, only a project as exciting as this or something filled with love as making these cupcakes could keep me awake, longer and way past my bed time, until I was done with icing 120 cupcakes by 3 am in the morning. So we had a mickey mouse themed birthday party as chosen by the birthday boy himself for which I made mini chocolate cupcakes with decorative icing. And these different shapes of cookies, also chosen by the birthday baby. With a lot of food, fun, games and his friends in attendance, all had a good time! These vanilla cupcakes were made by me to be taken to school on his star birthday (birthday based on the hindu calendar) where I was welcomed by a loud cheering from excited 4 year olds when they cast their sight upon them. And they were gone in minutes! 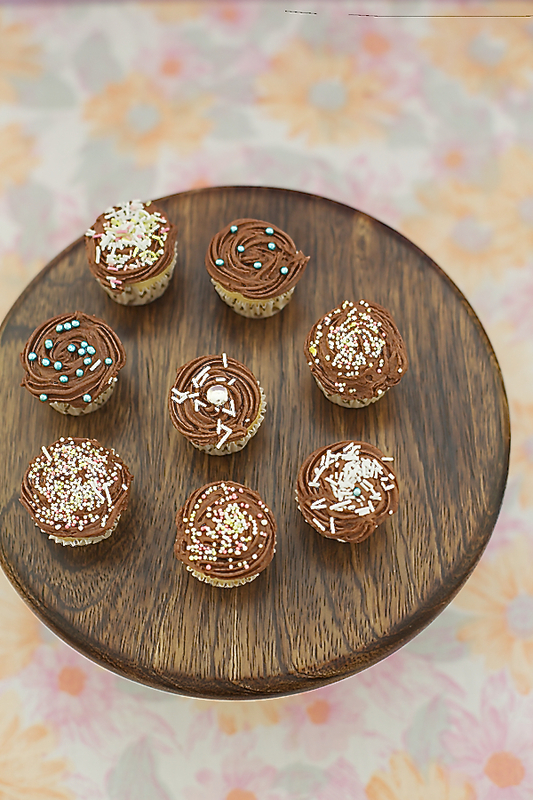 These tiny cupcakes are great for little ones or even for adult parties if you want to serve bite sized pieces. Ofcourse there is always the option of doing the regular sized ones as well. 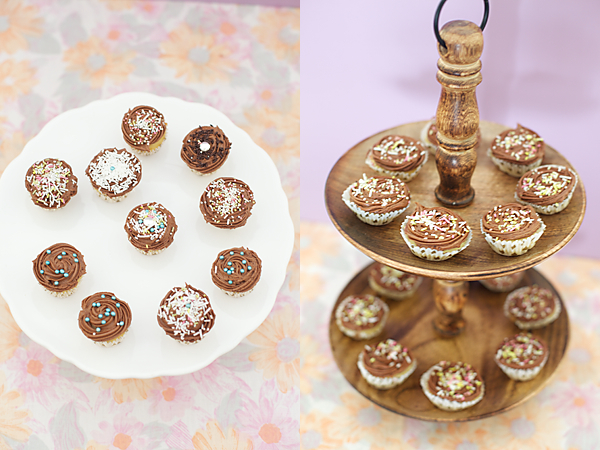 The cup cakes were soft with a melt in the mouth texture coupled with a lovely taste and the soft, creamy, buttery and chocolatey icing provided the perfect foil for these cutie pies. And I came back home a satisfied mother! This is a large batch/quantity recipe. Halve the recipe for a smaller crowd. You can mix in edible colours of your choice by skipping the cocoa and making a vanilla buttercream instead of a chocolate buttercream. 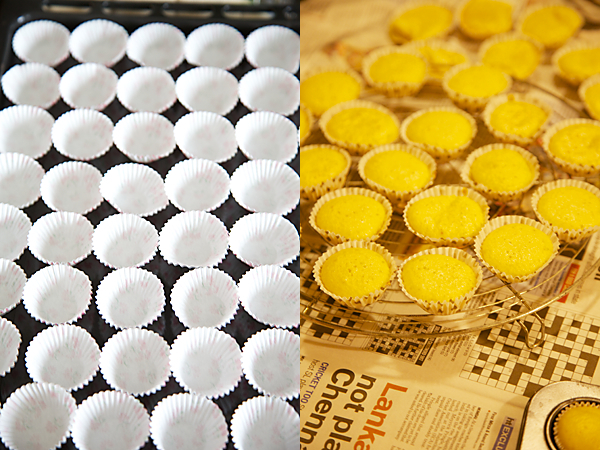 Line a 12 numbered cupcake or muffin pan with cupcake liners. In a bowl assemble all the dry ingredients the plain flour, corn starch, baking powder and soda together and sieve together once. Pre heat the oven to 175 C/350 F.
In another bowl put in the milk and vinegar and allow it to sit for about five minutes. Put in the granulated sugar and oil and blend with a blender until the sugar dissolves. Stir in the vanilla extract. Now put in the sieved dry ingredients into the liquid ingredients, add the additonal 2 tbsp water and blend with a blender until well mixed about 3 to 4 minutes. With the help of an ice cream scoop or a spoon drop the batter into the cupcake liners and bake for about 20 minutes for regular cupcakes and 10 minutes for mini cupcakes. In a stand mixer with the paddle attachment or in a food processor or in a large bowl using a hand beater or a wire whisk, cream the butter and stir in the confectioners/powdered sugar and cocoa, mix on low speed and cream again until soft and creamy. Stir in the vanilla extract or other flavouring of choice and beat again for a couple of minutes. This is a flexible recipe and if your icing is stiff add a little more milk, a tablespoon at a time and if your icing is thin, stir in more powdered sugar. Spread the icing over the cakes with a spoon or with an icing bag (cut a tiny hole in it). Or put the icing in a bag and fitted with a star or other nozzle of your choice, pipe designs. 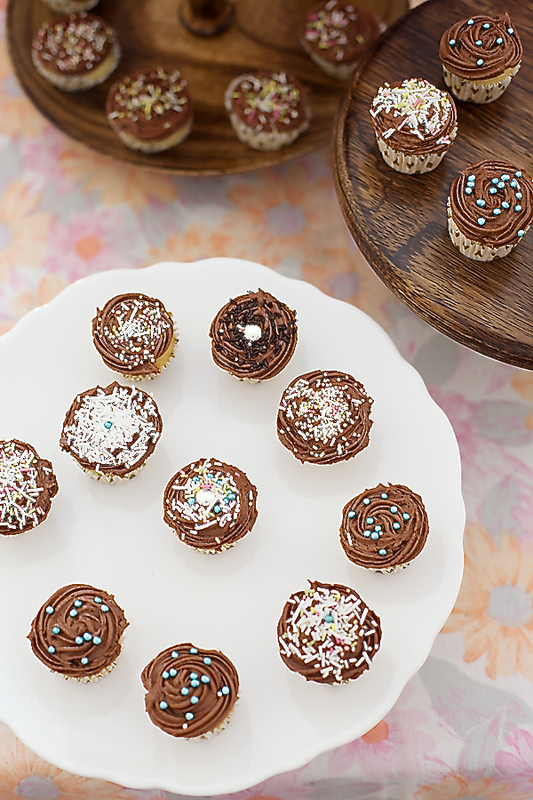 Decorate with sprinkles or other cake decorations of your choice. Using granulated sugar increases the weight of the sugar and so if you decide to use castor or powder sugar then icrease the quanity by 1/2 cup. Makes 24 cupcakes or 48 or more mini cupcakes based on the size of the cupcake liners. 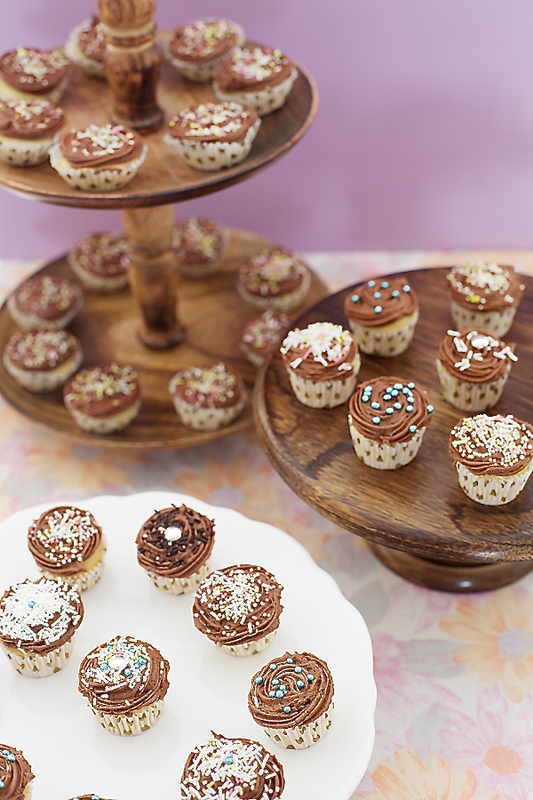 Love the idea of mini cupcakes for a party. 120 cupcakes! You have a lot of patience Anushruti. Lovely photos, esp the one with you and your little boy. Thanks for sharing the recipe. Love the idea….going to try it my daughter will love it. Lovely photo with you and your gorgeous son. Your little one is so cute, so are the cupcakes.The pic with the inside shot shows the beautiful texture, that's money, lovely just lovely. Anu how far ahead should one plan to make these for a crowd,I mean did you prepare the batter all at once or made them in batches on the same day ? or on separate days. Manmita: I made the batter at once in a stand mixer and these are best prepared fresh as close to the d date as possible. You could prepare the frosting a day in advance and refrigerate it. Oh my! 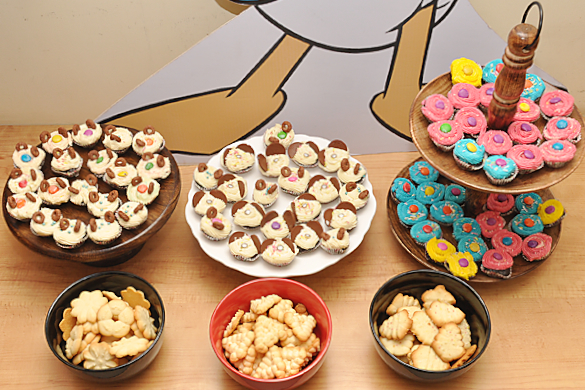 120 cupcakes, plus those absolutely gorgeous cookies! You surely are a supermom! I'd been scouting around for a recipe for vanilla cake with no butter in it, and I'm so happy you posted this! Your recipes are sureshot winners all the time! Could you please post a recipe of the cookies as well? Thanks in advance! Stunning cupcakes with beautiful frosting..You are great and super woman to make 120cupcakes, thats mindblowing,beautiful cookies too. Best Post till date……I wish and pray that your life never gets drab,dull ,sad or monotonous….may each and every day bring more & more bright colours,happiness and excitement to your life…Amen. I am a regular reader of your blog and have tried out some of the recipes. They have never failed me. Having a husband who is a vegetarian, I do like to try out dessert recipes that he can eat too. May your little one have a long, happy and healthy life! Happy 4th b'day to the lil'one and I'm a fan of your eggless bakes and I have tried a cake and brownie from here and they have come out great. I have a convection mode LG microwave, and i am confused if i need to bake these cakes using the convection mode or the microwave mode ? pls. help. 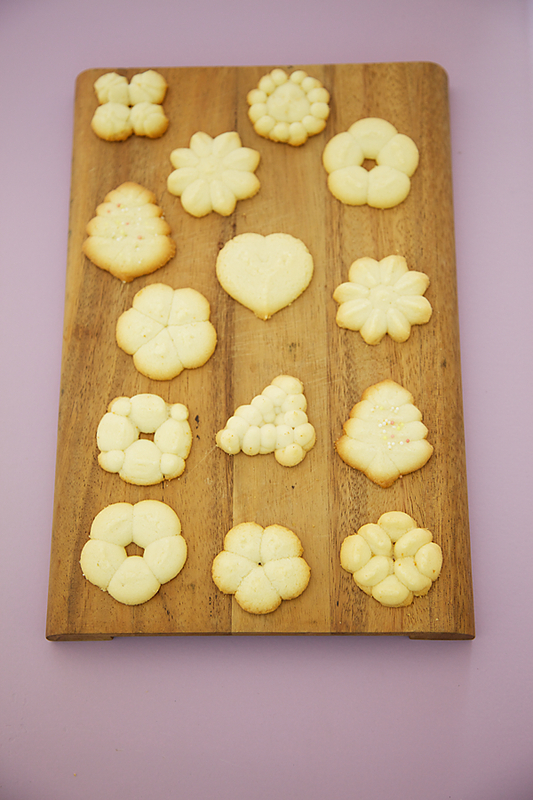 For those of you who have asked for the cookie recipe, it has already been posted on divinetaste. http://www.divinetaste.com/archives/melting-momentsperfect-eggless-cookies/ Have added the link to the post. Shruti: That's a lovely wish! Thanks! Sunita: Thanks for your feedback. Look forward to hearing more from you. 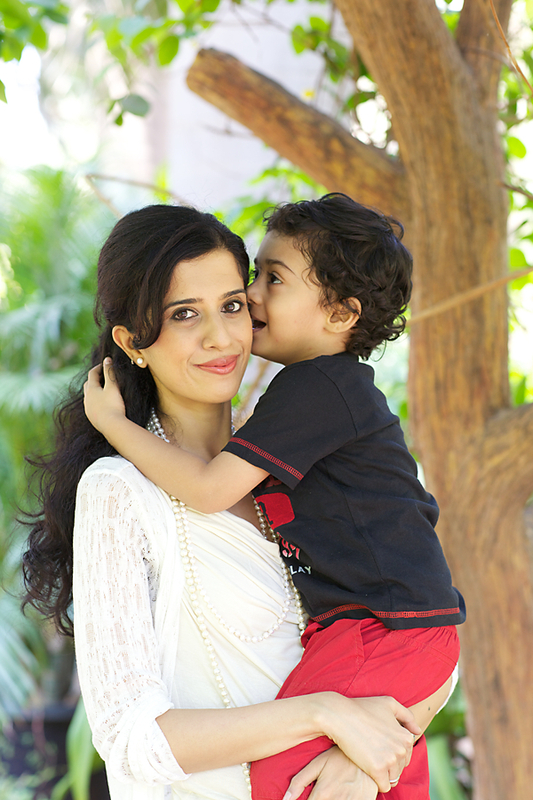 Manju: Its such an awesome feeling when you have your child in your arms..there couldnt be anything better for a mother! Seetha: I dont recommend using a microwave oven for baking. Especially for special occasions. Apart from the taste and texture, there are health concerns arising from the radiations of a microwave. That said, cakes are baked in the convection mode. Gayatri: If you get the consistency of the icing right it wont melt. I have kept the icing for hours despite the Mumbai heat and humidity. However, if you make cream icing you have to keep it refrigerated. I had put up these cakes iced with buttercream in the Mumbai heat for 4 to 5 hours and they stayed put without melting. I think i am too late to catch up with this post. I am sure ur little one would enjoy every moment with a mother like u:). This is a recipe to preserve and i will update as soon as i make use of it. thanks a lot. Slightly late on commenting and asking questions regarding this recipe.. It sounds like a great recipe and the pictures are absolutely delightful! When u mention flour in most of your recipes; do you mean refined flour (maida) or plain wheat flour? Also, which cream is to be used here? amul fresh cream tetra packs or hand made cream? What is flour-Is it maida? I tried this recipe today and I totally loved it. The texture was so lovely and soft. do 100 cupcakes for her new born babynoy's naming ceremony! Thank u so much for sharing it. Anuja: Don't worry every experienced baker today was an amateur some day. Plain flour is maida. You can use Amul fresh cream here. Is there any substitute for the vinegar? Can I use lemon juice/lime juice instead? I really love this delicious cupcakes. My mouth is watering now. You prepared yummy recipe here. I will surely try this recipe for my kids. They gonna love it. after trying vanilla cupcakes all my misconceptions about eggless baking is clear . They were so soft , spongy and delicious . I tried with exact measurement and made almost 28 medium cup cakes .Please advise measurement for small batch of 12-15 … if i use 1 cup flour how much cornflour and sugar should i use . Can't wait to try this! I've been on a quest to find a good eggless cupcake recipe as my oldest son has just started preschool and it broke my heart when I brought cupcakes to his class on his birthday but found out on that day that one of his classmates has an egg allergy and could only sit there and watch as the rest of the kids munched on the cupcakes I made. He was so upset and I don't blame him! So I've started my journey of learning to how bake eggless. Besides for my son's classmate but also for my mother-in-law (MIL) as she has high cholesterol but love my bake goods. Will let you know how these turn out as I'm baking Thanksgiving cupcakes for my son's class next week. Hi again. I just read through the instructions for making the cupcakes and I'm confused about one thing. You listed 4 Tbsp of water in the ingredients section; however, in the instructions you only use 2 Tbsp of water in the last section (2nd last paragraph where you instruct to mix the dry ingredients with the wet ingredients). Am I missing something? Please advise as I'm baking this recipe next week. Thanks! Thanks so much for a recipe that I will definitely be making use of quite often! Please give me a replacement for vinegar if possible! Could you pls advise if this recipe could be used for a cake instead of cupcakes? I was skeptikal about these, but they are amazing! 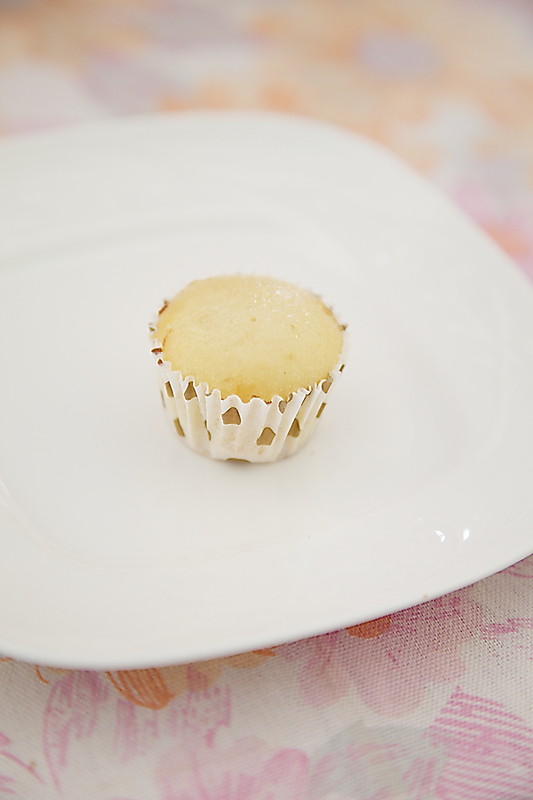 I have made a number of cupcakes without egg in the past and they are always dry or taste a bit off. These were great. Moist, fluffy and full of great flavor. Even 2 days later – these are still pretty moist. Great recipe! Thanks. 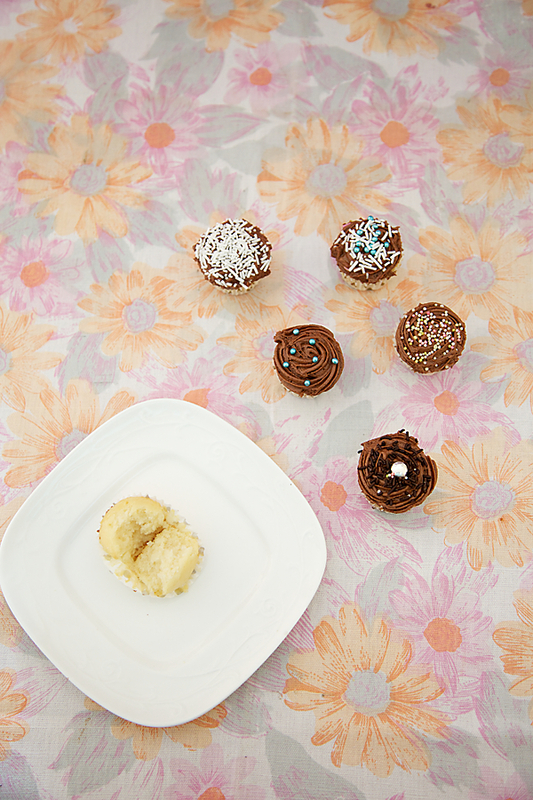 Sheenu: You can halve the recipe, by halving all the ingredients in the recipe and get 12 to 15 cupcakes. Frankie: Sorry for the delay. Have updated the recipe. NSJ: Noted 🙂 Use lime juice instead of vinegar. humisbaking: Ofcourse you could make this and bake as a single cake. Olivia: Thanks for the positive feedback! Can you tell which brand of butter you used ? These look really nice. Gonna try em over the holidays. One question: Did you use unsweetened cocoa powder for the frosting? I have ghiradelli unsweetened natural cocoa powder. Also, just wanted to clarify. Is cornstarch and corn flour interchangeable? I am in Canada and I see both are available. Daisy: Yes you could use ghirardelli cocoa powder that you have. I used unsweetened. Daisy: Cornflour as it is known here in India and some otehr countries, is the fine flour known as Corn starch in Canada and the US. Please go in for cornstarch. Congratulations on a beautifully written and presented blog. My oven does not have the preheat feature..what to do in that case. Apurva: Thank you for the compliments. Pre heating means, turning up the oven before the baking begins. There is no pre heat feature in ovens as such. Hope this helps. Thanks for such wonderful recipes. Hey i made the cupcakes and they taste yummy . only a slight problem though , i think i added a littele more sugar than necessary and now i want to balance it so should i add more butter?? Shivi: How nice! I'm happy to know that. jyoti: You will have to add more butter and more flour. Depends on how much extra sugar you have added actually. Thank you very much for the recipe. Cant wait to try it! I heard we can omit corn flour if we use cake flour. If I use cake flour, what would be the measurement? Please let me know. Thanks so much! amount from the video game. re taking an initiative towards finding out how to accomplish Gmail security and I wish you. Such beliefs are usually stored in the unconscious mind. Just came across your website upon googling eggless cupcakes. I made these cupcakes day before yesterday and it turned out quite nice. The only problem I had was that the baking soda seemed to be quite alot. Can we reduce or eliminate soda from this recipe and still get the same result? I had halved your recipe as advised by you. Rest was just awesome very soft and moist as you mentioned. Jyoti: A little more butter and a few drops of milk should do the trick! Jaydee: Since this is an eggless cake and the recipe is not written to replace the cake flour, I would suggest you go with the cornflour. If you want to replace it with cake flour then use 3 cups+ 4 tbsp, the same amount of flour and corn starch. Smriti: If you have halved the recipe, then 1/2 tsp is the minimum amount of soda required for this cake to rise. I havent experienced nor heard from anyone about the soda being more for this cake. Did you use exactly 1/2 a tsp (2.5 ml)? Did you sieve well as bits of cooking soda from an unsieved flour mixture can be very unpleasant in the end product? These are the questions that you should be thinking of answering before thinking of reducing the soda. Thanks Anushruti. I did both the above. I will try it again and see, maybe sieve it twice to be sure. These cupcakes look amazing! I'm an amateur baker and a pure vegetarian in London, UK. With regards to the cream that you used, is this single or double cream as we don't get the Amul brand here in the UK so I have to find the next best alternative. Amanda: Thank you. You can use single cream as the cream I used has 25% fat. hi i tried out the cupcakes ,it was moist and soft but the top was v.sticky what could be the reason have followed the same measurments..
exposure! Keep up the good works guys I've added you guys to blogroll. Thanks a lot, and keep posting such amazing receipes. Nidhi: The measuring cup used in all my recipes is a standard 250 ml cup. Looks like you have gone wrong with the measurements. Please measure carefully while baking. I made 4cupcakes as trial from this vanilla cupcake recipe. The taste and texture came out very good. I used powdered sugar, increased the sugar content by 1/2 cup and the cupcakes were quite sweet. Next time I wont add the extra powdered sugar and I guess they should be fine..
Hi, i would like to try your recipe for my allergic son. However i am confused since you are using blender? Or do you mean electric mixer? Or either one is fine? I am affraid i am over mixing it and it become rubbery. Pls advise. Imelda: You can use either a blender or an electric mixer. Or any mixing tool. Hope your son likes it. How many days in advance can the cupcakes be made for a birthday party. Also can thaw be refrigerated ? Sam: thanks for the feedback! A very happy New Year to U and your family. i have a doubt..when we add vinegar/lime juice to the milk has the milk to b luke warm/warm or at room temp ? do u use normal milk or any special type. i have tried this combination as a substitute for buttermilk. but mine curdles only partly. btw.. i use normal cow milk (leftover after boiling milk for daily chai) and lemon juice. thanx in advance. valli: I use normal cow milk at room temperature or maybe luke warm at times, for this recipe. Allow it to rest for 5 minutes after adding the lime juice. It need not curdle. These cupcakes look scrumptious. Cannot wait to try them. Your son looks so adorable. Azna- Hope you like them. Thanks for the compliment. Rithika: Rice? Are you sure you havent used rice flour? Yes I'm very sure. Is it because of d cornflour? rithika- not sure as don't know what you are exactly doing. This is one of my most loved recipes, people enjoy these cakes to the core. All I can say is try and measure accurately and follow the directions properly. You are sure to get good results. Hi, your recipe looks great, can you pls advice, how can these vanilla cupcakes be made chocolate cupcakes? How many days in advance can we do it ? And how long can the cup cakes be kept outside in an air tight container ? 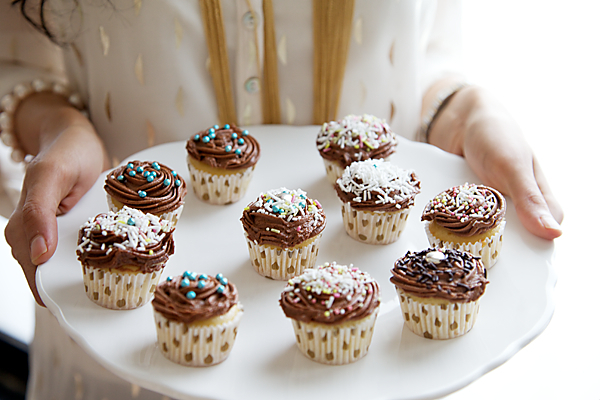 Nidhi- Please refer to my chocolate cupcake recipe, to make chocolate cupcakes. Tamil- I would suggest 24 hours in advance. Because of the buttercream, you can keep it outside the refrigerator for not more than 24 hours. If you plan to keep them for more than 24 hours, then please refrigerate the cupcakes. Tamil: The cake can be kept outside for a few hours. Depends on the weather and humdity as well. But I would suggest not keeping it outside for long if you intend to serve it the next day. 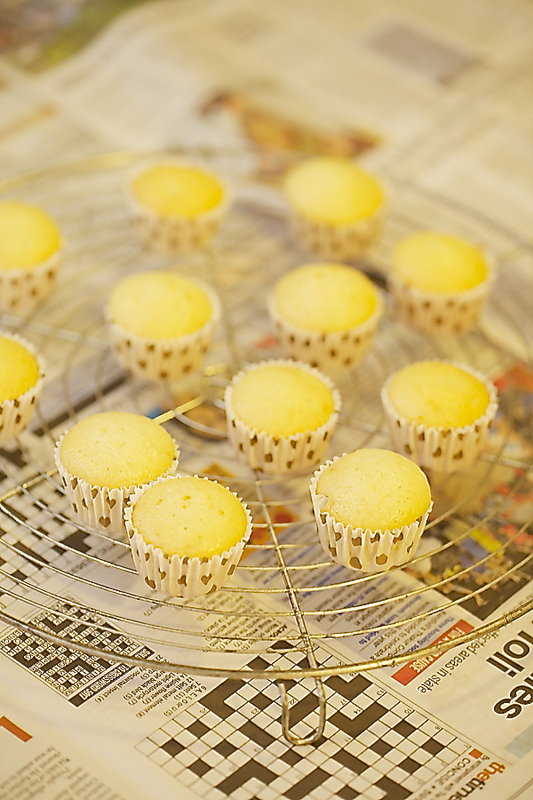 Make the cakes, allow them to cool and refrigerate them. Divya: You can halve the recipe if you want lesser quantity. Just halve everything. Hi Anushruti,communicating with you after a very long time…My query : You have mentioned Preferably Rice Bran Oil. Any specific reason for using this particular oil? I have attempted using Sundrop refined oil (the Blue Pouch) in the past for some other eggless recipes but, the flavour of the oil came through and it was disappointing. Request your advice. Thanks. which is preferred cornstarch or cornflour? Arundati- Rice bran oil is neutral and I find that it gives a very good flavour to baked goodies. sara- In India cornstarch is called cornflour. You need to use corn starch. Can I use butter instead of oil and if so how much butter do I use? I love your blog. Guess it was live at first sight! Especially your videos..they carry a very positive air and very clear explanations. Keep up the good work dear. I tried out your recipe (vanilla cupcakes with chocolate icing) but sad to say my cupcakes did not rise that well. It was soft but it was kind of flat. Secondly, the icing; whenever I make it the icing kind of melts off after a while.it doesn't come out that stuff as seen on your videos. Any tips in that would be helpful. Thanks again God bless. Sara- you can substitute butter with oil, the same quantity as the oil. But this cake tastes excellent when baked with oil too, trust me on that! Nancy- Great! You can replace, but the cakes will be heavier in texture. Awsome Dear Anu, came out so good. Only change I made was half whole wheat and half regular flour. Also used light tasting olive oil. You are simply superb. Please give more baking recipes. Thanks a lot. Jigna- Thank you for the feedback! Can I use cake flour instead? Which means I will minus the cornstarch and only use 21/2 cups cake flour? Your baking recipes are of great help for beginners like me. The measurements are very precise and ingredients used are easily available. Just love it. Keep doing your great work. I have a small query, can i substitute vinegar with same amount of lemon juice? Will i still get the same results? gayathri- Thanks for the feedback! Yes, you can substitute with lime juice. The acidity of lime varies depending on its variety, so I like to use vinegar to keep it standard. Jo- So happy to hear this! Thanks for the feedback.